IT’S A ROLE that Rupert Everett was born to play: Oscar Wilde. The British actor’s obsession with the Irish author is long known (he played him in a one-man play The Judas Kiss in 2012), but it’s come full circle with the release of The Happy Prince, a film about Wilde’s final years, which is written, directed by and stars Everett. When we meet during Everett’s extensive press trip for the film, the actor is dressed down in a black hoodie (well, it’s by Helmut Lang, so an upmarket hoodie) and sporting a full beard. He looks refreshed, the opposite to Wilde in The Happy Prince, who is visibly haunted by what he’s been through. He’s bloated and tired, but he still retains his trademark wit. In the film we meet Wilde while he’s on his deathbed, as he reflects on a fascinating – though truncated – life. He died aged just 46, in November 1900, broken by a tough trial over his homosexuality. The author and playwright was punished for being himself, and this punishment left an indelible mark on him. “His humiliation in the Old Bailey was such a huge thing, and his imprisonment with hard labour and then his exile in the north of France and then the fact he went back to the boyfriend [Bosie] who he said he’d never talk to again in his life was… just the most extraordinary story. And then once he’d done that that blew every single thing he might have achieved afterwards out of the water,” says Everett. He doesn’t shy away from showing that side to Wilde in the film – the pressure that was put on him and the physical and mental effects it had. Everett is one of the few gay actors who has been open about his sexuality for decades, and he believes that it may have cost him roles. The price of being honest can be too high for some people in Hollywood, never mind elsewhere around the world. Everett has long mixed with fascinating people – Julia Roberts, Madonna – and written two memoirs about his time in the spotlight. He’s lived his life in the public view, and seeing how men like Wilde were treated appears to only fuel his desire to ensure he shines a light on the way we treat people who are LGBTQIA. As the past is not so far away, TheJournal.ie asks Everett if it’s tempting for us to look back now and think “aren’t we so great compared to the 19th century” when it comes to how we treat minorities. “We’re worse in many parts of the world and Oscar Wilde’s treatment is better than someone probably in Uganda, or Jamaica, or in Russia, or in China, or in India or in probably three quarters of the world,” is Everett’s response. “In our world I think things have changed a lot for the better for the most part and I think the UK and Ireland are probably the two best places in the world to be gay. But sexuality is still this extraordinary issue for people and that is the thing that doesn’t still go away because even if there is a thaw on the iceberg slightly in showbusiness, there doesn’t seem to be one in sport, there has been one in politics I suppose but it’s a weird thing. It still seems to be a very blocking issue. Wilde was a famous writer, but he was also famous for his character, “for the way he lit up rooms and kept the whole Café Royal in thrall”. But was it difficult to play his hero during the toughest time of his life? “I don’t think it is in a way because one’s been through so much of writing the story and plotting the scenes – I mean obviously as an actor, you get into the role,” says Everett. “But outside of that, I was just concentrating on getting each scene done and moving on to the next. We were so short of time making the film that I couldn’t make one mistake because if I didn’t manage to do a scene then it would never be shot, because we never had a contingency plan to do something at another date. It is a very sad story but you don’t really think of it like that when you’re making it in a way. Being director and star meant that Everett was pulled in different directions, particularly when the shoots were very tight. The movie was filmed on location in a number of European locations: Bavaria, Brussels, Wallonia and Naples, with Everett determined to bring to life Wilde’s 19th century bohemian lifestyle. They had just one week to shoot in Naples (where Wilde tried to rebuild his relationship with Bosie), and had quite a challenge finding the sets in Belgium and Germany. They discovered a castle in Bavaria where they were able to shoot multiple locations – the prison, bedroom and even a shanty street. The Paris scenes were shot in Brussels and Wallonia, and they wrapped the shoot in Normandy, where they were able to shoot in the Hotel des Roches where Wilde stayed. But for all its stress, it was a shoot that had a lot of love in it. “We kept saying to each other, me and the few people that started together, we said we must try and have fun and we kept reminding ourselves of that as we were screaming at each other. It’s difficult to have fun on a thing like that because if you for me because there were so many things I had to keep control of and it just wasn’t that easy,” says Everett. Though not easy, it was clearly a passion project that was worth it. The Happy Prince is in cinemas on Friday 22 June. 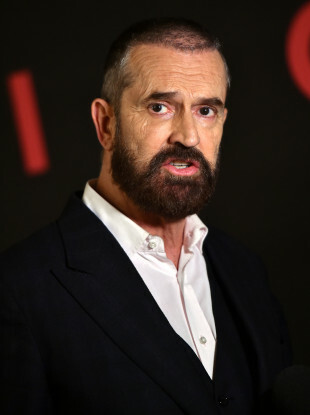 Email “Rupert Everett: 'The UK and Ireland are probably the two best places in the world to be gay'”. Feedback on “Rupert Everett: 'The UK and Ireland are probably the two best places in the world to be gay'”.